LDS Leaders Have Made Thousands of Changes to Mormon Scriptures — Why? Copyright © 1998, 2010 Institute for Religious Research. All rights reserved. Many people are unaware that over the years the Church of Jesus Christ of Latter-day Saints (Mormon Church) has made thousands of changes to its scriptures. LDS leaders have added and deleted words and tampered with previously published revelations by writing in new material and falsely attributing it to an earlier date. What follows are examples of some of the most significant revisions made to the Book of Mormon, the Doctrine and Covenants, and the Pearl of Great Price. Within this article are links to scanned images of these historical documents from the 1830s. "LDS leaders have added and deleted words and tampered with previously published revelations by writing in new material and falsely attributing it to an earlier date." Joseph Smith translated the Book of Mormon into English through the gift and power of God. He said that it is "the most correct of any book on earth, and the keystone of our religion, and a man would get nearer to God by abiding by its precepts, than by any other book" (History of the Church, 4:461). Yet, the book which Joseph Smith declared was "the most correct of any book on earth" (History of the Church, vol. 4, p. 461) has been revised in over 3900 places. Most of these changes were made to correct embarrassing spelling and grammatical errors (this will be examined in more detail later in this article). However, there are numerous other changes which affect the doctrinal teachings of the Book of Mormon. Changes in Doctrine. Key Passages on Deity in the original 1830 text of the Book of Mormon were changed in the 1837 edition to reflect Joseph Smith’s changing doctrine of Deity. Joseph originally taught that Jesus and the Father were the same person and that God had always been God, but later developed the idea that the Father and Son were separate Gods, each with a tangible body. Smith taught that both God the Father and Jesus had been mortal men. 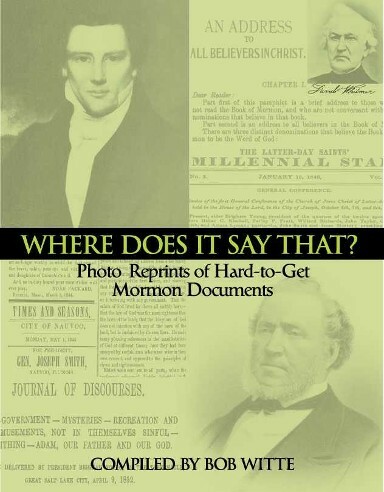 What follows are specific examples from the original 1830 first edition Book of Mormon (which did not have verse divisions) compared with the altered text of recent versions. *The 1830 text did not have verse divisions. 1 Nephi 11:18 — And he said unto me, Behold, the virgin whom thou seest is the mother of the Son of God. 1 Nephi 3, p. 25 — And the angel said unto me, behold the Lamb of God, even the Eternal Father! 1 Nephi 11:21 — And the angel said unto me, behold the Lamb of God, even the Son of the Eternal Father! 1 Nephi 3, p. 26 — And I looked and beheld the Lamb of God, that he was taken by the people; yea, the Everlasting God, was judged of the world. 1 Nephi 11:32 — And I looked and beheld the Lamb of God, that he was taken by the people; yea, the Son of the Everlasting God, was judged of the world. 1 Nephi 3, p. 32 — These last records ... shall make known to all kindreds, tongues, and people, that the Lamb of God is the Eternal Father and the Savior of the world. 1 Nephi 13:40 — These last records ... shall make known to all kindreds, tongues, and people, that the Lamb of God is the Sonof the Eternal Father and the Savior of the world. Other Changes to the Book of Mormon. A variety of other changes have been made that also alter the meaning of the text. Alma 15, p. 303 — yea, decreeth unto them decrees which are unalterable, according to their wills. Alma 29:4 — Yea, I know that he alloteth unto men, yea, decreeth unto them decrees which are unalterable, according to their wills. Note: Later editions from at least 1840 to 1980 deleted without explanation these eight words. LDS leaders re-inserted the omitted words into all editions since 1981. Note: According to Book of Mormon chronology, King Benjamin was already dead when these events took place. Apparently LDS leaders changed the name to Mosiah to eliminate the mistake. 2 Nephi 12, p. 117 — … and many generations shall not pass away among them, save they shall be a white and a delightsome people. 2 Nephi 30:6 (1840 edition) — … and many generations shall not pass away among them, save they shall be a white pure and a delightsome people. Note: Before 1978 dark-skinned males were not allowed to hold positions of priesthood authority within the Mormon church. Today Mormon scriptures continue to teach that dark skin is a curse from God and a sign of His displeasure (See 1 Nephi 12:23; 2 Nephi 5:21; Alma 3:6). Brigham Young, second president and prophet of the LDS church referred to those with dark skin as being "cursed with a s[k]in of blackness" (Journal of Discourses, vol. 11, p. 272). While the following short sampling of changes do not affect the meaning of the text, they do reveal the human origin of the book..
Improper use of "was" in 1830 edition later changed to "were"
Improper use of "is" in the 1830 edition later changed to "are"
"Behold the Scriptures are before you; if ye will arrest them, it shall be to your own destruction." [p. 260] The word "arrest" is now changed to "wrest" [Alma 13:20]. "… they were exceeding fraid …" [pp. 354, 392, 415]. The phrase "exceeding fraid" is now changed to "exceedingly afraid" [Alma 47:2; 58:24; Helaman 4:3]. "… my soul was wrecked with eternal torment …" [p. 214]. The word "wrecked" is now changed to "racked" [Mosiah 27:29]. The Mormon scripture called the Doctrine and Covenants is a series of revelations which Joseph Smith and other LDS prophets claimed to receive directly from God. The first of these revelations were printed in The Book of Commandments in the year 1833. Since that time many of these revelations have been radically altered, with words and even whole sentences deleted. In other places later doctrinal innovations were written back into earlier revelations to hide the glaring contradictions that would otherwise result. In this way, events that were previously unheard of suddenly become part of the historical record as a revelation from God. BC 4:2, p. 10 — and he has a gift to translate the book [of Mormon], and I have commanded him that he shall pretend to no other gift, for I will grant him no other gift. D&C 5:4 — And you have a gift to translate the plates; [and this is the first gift that I bestowed upon you;] and I have commanded that you should pretend to no other gift [until my purpose is fulfilled in this;] for I will grant unto you no other gift [until it is finished]. Note: At this point in the revelation over 300 words are added regarding the restoration of the Mormon priesthood by means of divine ordination. By making the account part of a revelation that is dated to 1830, it appears the story has been known since then. However, it is not a part of any revelation until the 1835 edition of the Doctrine & Covenants (section L (50) v. 2, p. 180). Apparently Joseph Smith and Oliver Cowdery, who were in charge of editing the 1835 D&C, inserted this material so that the concept of the Aaronic and Melchizedek priesthoods being restored and the office of high priest would appear to have been in place from the start and would appear to have been given directly by God. The revelation concludes with over 130 additional words, taken from the Bible copied almost verbatim from Ephesians 6:13-17. No explanation is given for the dating discrepancy. BC 44:26, p. 92 — If thou lovest me thou shalt serve me and keep all my commandments; and behold, thou shalt consecrate all thy properties, that which thou hast unto me, with a covenant and a deed which can not be broken; and they shall be laid before the bishop of my church, and two of the elders, such as he shall appoint and set apart for that purpose. Note: By 1835 when the D&C was printed Joseph Smith had given up on the idea of communalism. Therefore this revelation was changed so that Mormons were no longer told by God to consecrate all their properties, but instead the emphasis is shifted to a command to remember the poor and give "of your property". Also, at the time the revelation was originally given there was no office of "counselor" or "high priest" in the Mormon church, so these also had to be added to the revelation retroactively, once again giving the appearance these offices were there from the beginning. [View Book of Commandments text.] D&C 10:1 9:1 — Now, behold I say unto you, that because you delivered up so many [those] writings, which you had power [given unto you] to translate [by the means of the Urim and Thummim], into the hands of a wicked man, you have lost them. (v.2) And you also lost your gift at the same time, [and your mind became darkened]. Note: There is no mention of the Old Testament Urim and Thummim in the Book of Mormon nor is there any connection of the Urim and Thummim to the translation of the Book of Mormon until 1833, which is four years after this revelation was supposedly given. Another example of a revelation that has undergone hundreds of changes was first published in The Evening & Morning Star in October 1832. The revelation was said to have been received in November of 1831. This revelation is now D&C 68 and contains multiple references to the Melchizedek priesthood, high priests and the First Presidency. Once again the attempt is made to write later developments into previously given revelations to make them fit Joseph’s evolving church structure. As with the Doctrine and Covenants, LDS leaders have altered the revelations contained in the Pearl of Great Price. PGP Moses, p. 14 — And the woman said, The serpent beguiled me, and I did eat. And again, the Lord said unto the woman, I will greatly multiply your sorrow, and your conception. PGP Moses 4:19-22 — And the woman said, The serpent beguiled me, and I did eat. And again, [I] the Lord [God] said unto the [serpent: Because thou has done this thou shalt be cursed above all cattle, and above every beast of the field; upon they belly shalt thou go, and dust shalt thou eat all the days of thy life; And I will put enmity between thee and the woman, between thy seed and her seed; and he shall bruise thy head, and thou shalt bruise his heel. Unto the] woman, [I the Lord God said], I will greatly multiply [thy] your sorrow, and [thy] your conception. PGP Moses, p. 16 — And the Lord said unto Cain, why are you angry? Why is your countenance fallen? If you do well, will you not be accepted? And if you do not well, sin lies at the door, and Satan desires to have you; and except you shall hearken unto my commandments, I will deliver you up, and it shall be unto you according to his desire. Note: At this point there are an additional 200 words added to this passage including Cain making a pact directly with Satan to be able to kill his brother Abel. PGP JS History, p. 41 — He called me by name and said unto me, that he was a messenger sent from the presence of God to me, and that his name was Nephi. PGP JS History, 1:33 — He called me by name and said unto me, that he was a messenger sent from the presence of God to me, and that his name was Moroni. Note: All evidence indicates this change was made after the death of Joseph Smith, and cannot be considered a clerical error. Both the handwritten manuscripts for the History of the Church, and the printed history in the Church newspaper Times and Seasons (of which Joseph Smith was editor) give the visiting personage’s name as "Nephi." If, as the Mormon Church claims, the original revelations came directly from God, what justifies the tampering documented above? What other areas of history or doctrine have been covered up or tampered with to maintain the LDS church image? Does this evidence warrant further investigation of the historical and spiritual roots of the LDS Church? We welcome your inquires, questions and concerns. Feel free to write us using the email link at the top of this page. It is no use resisting the matter. The old theory must be abandoned. It could only come into existence and remain so long and now be clung to by some so tenaciously because our fathers and our people in the past and now were and are uncritical" (B.H. Roberts, Defense of the Faith, pp. 306-308). The new theory proposed by Roberts, and still popular today, is that God only gave Joseph the ideas and concepts for the Book of Mormon. These Joseph recorded in his own grammatically poor language and style. With this new theory, LDS leaders justified themselves in making thousands of word changes designed to enhance the quality and credibility of the Book of Mormon. A serious problem with the theory of Joseph receiving only inspired ideas and concepts and then rendering them into his own words after much study and contemplation, is that there is no historical evidence to support it. It is a theory born of necessity in the minds of LDS leaders decades after the fact. Compare this with the word-for-word dictation method which has extensive testimony from those who were closest to Joseph personally and present during the act of dictating the Book of Mormon. Today the Mormon Church gives potential converts a copy of a corrected and grammatically sanitized Book of Mormon but still points to Joseph Smith’s lack of education as evidence for its divine origin. What is implied is that Joseph could not have produced such a book without divine aid. What they do not say is that Joseph’s poor grammar, so evident in the first edition, is now masked by thousands of changes and corrections made by later LDS leaders. As a result, today we do not have the Book of Mormon as it came from the hand of Joseph Smith, but rather a heavily edited version as it has come through the hands of LDS church leaders. 2. Click here for further information on Smith’s failed attempt at translating Egyptian. For details on Joseph’s false revisions to the King James Bible see, Joseph Smith’s "Inspired" Revisions to the King James Bible.